It’s the question of the day for importers: When do I need to use Full Truckload Shipping (FTL) versus LTL (less than Truckload)? After all, maybe you don’t have enough to fill an entire truck! What are the guidelines? How can I be sure I am not paying too much? This is often the biggest headache for people that are responsible for a company’s supply chain. First, let’s look at the guidelines for LTL. In most cases, the space/weight limit for using LTL (less than Truckload) shipping is 20 linear feet of needed space, or 20,000 pounds. If you are over on either of those guidelines, you are going to use Full Truckload Shipping versus LTL; either on a Dedicated or Partial basis regardless of if you have an entire trailer full, or not. There are a lot of other guidelines and rules, which your LTL shipper and Licensed Customs Broker will advise you of from the start. For instance, there are limits to how large and heavy one item can be. There are also rules regarding non stackable items and density for trucks that we will cover later. A Licensed Customs Broker and a Logistics Professional will guide you through the Full Truckload Shipping maze. A good Logistics Professional, or team, is essential to keeping the Supply Chain humming along. Secondly, let’s talk about “Volume LTL.” In this category falls everything which does not fill an entire trailer, up to 28 feet. Your LTL provider will go ahead and pick up this freight, and move it but the wisest course of action is to make sure your Logistics Professional also checks for partial truckload pricing and service for the same freight. If you and/or your Logistics Professional take a few extra moments, you can find the best service and cost savings for your shipment. Cheaper is not always better. And easier is not always cheaper, when it comes to shipping. 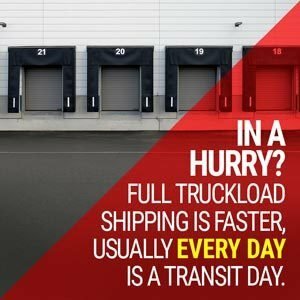 When do you need Dedicated Full Truckload Shipping? 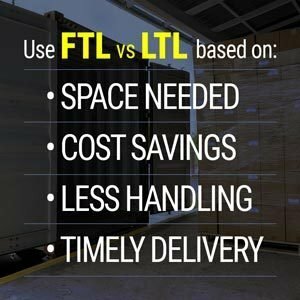 What’s the Difference between FTL and LTL? What’s Safer for Fragile Freight? Partial Truckload may, in fact, be cheaper that Volume LTL. Whenever a load takes up a large amount of space in an LTL trailer, a premium is charged for this. Why? Because it limits the number of stops a driver can complete without returning to the terminal to get an empty trailer, costing the route driver extra time, and mileage. Time is money, right? An LTL shipment makes a lot of stops. How many stops depends on how far the truck is going and through which Metro areas. Remember that the freight will be offloaded at each stop and put on another truck to complete its journey. Your shipment also shares the space with multiple other packages and products. While every effort is made to protect every pallet, it’s just common sense to know that every time it is taken from one truck to another increases its chances for damages. Lastly, depending on your product, consider whether it will stand up to being cross docked multiple times, without risk of being damaged. If you are moving anvils, it’s probably OK. If you are moving artwork, this may not be the best choice. A truckload shipment does not transit through terminals and usually only shares the truck with 1 or 2 other shipments. The driver picks it up and delivers it without cross docking it anywhere. Let’s go back to the fact that truckloads don’t move through terminals and that a driver picks up at Point A and delivers to Point B directly. Check your transit time requirements and see if LTL or Truckload is a better fit for your timeline needs. Also, remember that when calculating transit days, LTL does not count weekends or holidays and Full Truckload Shipping usually counts every day as a transit day. So, a three day transit picking up on Friday on LTL will really deliver Wednesday or Thursday. But a three day transit traveling via Full Truckload picking up on Friday will generally deliver Tuesday. Your freight has time constraints, i.e. delivery appointments, deadlines, etc. Your freight needs special handling – as in e-trac, strapping, secured to floor, etc. You cannot accomplish this when your freight is being moved from trailer to trailer. It needs to stay on one trailer from start to finish. The trucking industry offers both full truckload (FTL) and less than truckload (LTL) options to cater to a variety of shippers. Do you need the services of full truckload or less than truckload? These talking points will help you answer that question. Full truckloads (FTL) take up 20-feet of truck space or more and/or weigh more than 20,000 pounds. Less than truckload (LTL) means that the items being shipped take up less than 20-feet of flat bed truck space or weigh less than 20,000 pounds. FTL shipments are only handled by the shipper and the receiver. These shipments save time by skipping the shipping terminal system. With LTL loads, pay only for the amount of space your shipment takes up on the truck. This results in a large freight shipping cost savings for the customer. LTL shipments can also be handled by several terminals, giving you more shipping options and flexibility as you transport your goods. FTL loads have one bulk shipment, which is easier to get to one destination. They typically win the arrival race. LTL loads have a variety of shipments going to separate destinations. This makes delivery times longer than an FTL load because the truck has multiple destination delivery stops. 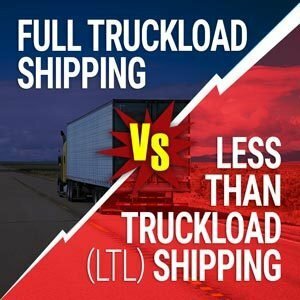 LTL loads utilize shipments from multiple customers, making it the more affordable option for importers unless you have bulk shipments that need an FTL load. FTL loads pay for the services of the entire truck. FTL freight shipments usually have an entire shipment of freight going to one customer, making it the preferred option for fragile, high risk or delicate freight because it is only loaded and unloaded once. 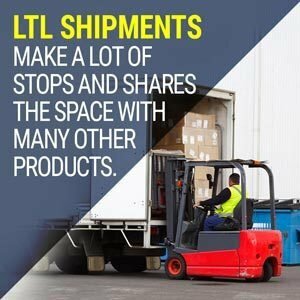 LTL freight shares space in the truck with other shipments. A variety of truckload carrier domestic shipping services are crucial to the success of your business for national shipping. Follow our guide to navigate the 8 R+L Global domestic shipping services that work to get your shipments delivered efficiently and on time. Truckload is the domestic shipping workhorse of a supply chain, working to offer you both Full Truckload (FTL) and Less Than Truckload (LTL) options. For those seeking to ship items that take up less than 20-feet of truck space or weigh less than 20,000 pounds, LTL trucking services are the perfect solution. With LTL, you only pay the trucking company for the space you need. FTL loads, or full truckload shipments, fill up an entire truck. Expedited shipping services with freight experts allow your time sensitive hazmat, temperature control and high value freight to arrive on time when you need it. Intermodal transportation solutions help you meet your company’s supply chain needs, shipping freight via truck, rail and water. Do you have refrigeration truckload freight shipping needs? Take advantage of temperature controlled shipping with the best refrigerated trucks and vans to deliver your climate controlled freight. Utilize dry van shipping needs for hazmat, expedited and high volume cargo at competitive rates for both short and long haul domestic shipping deliveries. Flatbed services offer specialized needs for regular flatbed or multi-axle trailer options for larger shipping needs. If you only have one shipment that needs delivered to a U.S. port of entry, a single entry bond is what you need. 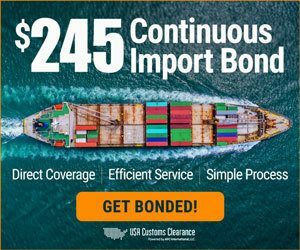 Use this type of customs bond if you ship four times a year or less and when you have freight that doesn’t have a high value. If you ship imports on a regular basis, you need a continuous bond. These bonds renew every year allow you to ship as many import freight shipments as you need. This is also the bond you need to cover shipments that come along with high value. It’s important to calculate the customs bond type you need. We also have cargo insurance available through our supply chain network and can help you purchase additional insurance. You need to import goods quickly. Your importing value is higher than $2,500, which mandates you to purchase a customs bond. Strict deadlines must be met. Whew! That’s a lot of information! The bottom line is, use common sense, and make sure to lean on your Licensed Customs Broker and Logistics Professionals to help you determine the best shipping methods when considering Full Truckload versus Less than Truckload. Don’t feel shy about comparing rates and services to get what is the best fit for your importing and shipping needs and budget. That’s what we are here for! You now have the knowledge you need to prepare your imports for shipping once they reach U.S. ports of entry. A good Logistics Professional will always put your needs first and seek to develop a long term shipping relationship with you. Finding a Logistics Professional that you can trust and who is knowledgeable about Full Truckload Shipping versus LTL will make all the difference in the successful outcome for your shipment. This also results in happy customers! If you feel like your Logistics Professional is rushing through your quote request and not asking enough questions about your shipment and supply chain needs to find the best cost savings and service level for you, it’s probably time to shop. You want to find a Logistics Professional that has your best interests in mind, and cares about finding real solutions for your supply chain complexities. After all, happy customers are repeat customers and that is the ultimate goal for everyone! Finding a Licensed Customs Broker to help you with your importing needs is also a huge help. When you work with USA Customs Clearance, you are choosing to make the import process a successful process. Our value-added customs brokerage services available through our partner AFC International, allows Licensed Customs Agents to handle all of your importing needs. Click the bottom right chat box to have your questions answered in real time. Receive a customs bond quote today!